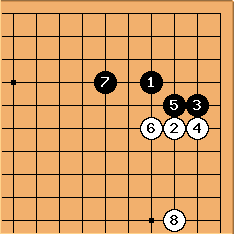 Especially in DDK games Joseki are rarely played out, use these to get a feel for the opening, variate from them so you can learn, almost always your opponent will variate from them. 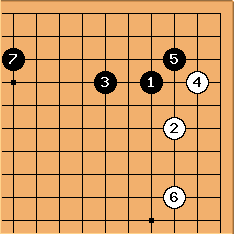 These are merely a tool to learn with, not an end-all-be-all of go, try to see what the moves do, this will help you learn to think for your self. Now for the credits: Major help was provided by KGS user Cookies, he created the list, I thought of the page. When this page is complete there should be about 10-20. Now I just got to get around to entering them in. 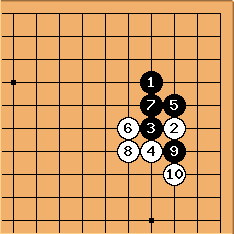 Ten could also be at A.
tapir: I'm EGF 2k but I don't know the seventh and the eighth here. 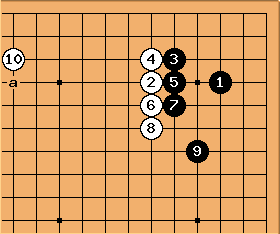 So I doubt every DDK should know those joseki, at least I say he/she need not to :) (In the 7th is played at most of the time, afaik.) + I doubt anyone should now the 4th one before he knows the reason for at exactly this point. Do u know HermanHiddema/JosekiLearningOrder? He tries to do sth. similar like this page. Welcome to SL, btw. 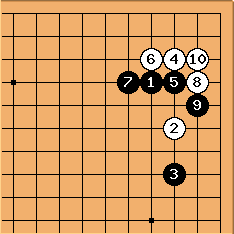 unkx80: The eighth is joseki, as far as I know. Tapir: Yeah, I believe. 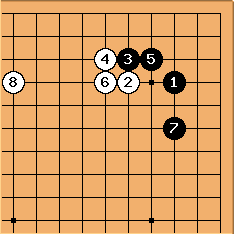 But you can go a long way in SDK ranks without knowing it :P Regarding the 5th, I've recently seen a tsumego (follow up after white 3-3 invasion - do we have it here?) in which is right in place - ok this may not be the only reason. But we all - including our local 2 dan were a bit surprised to learn about that. 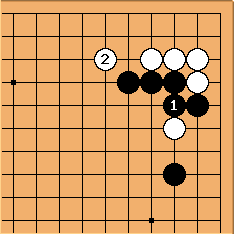 Andy: The twelfth one doesn't look good for black for similar reasons to why the third one doesn't look good for black. 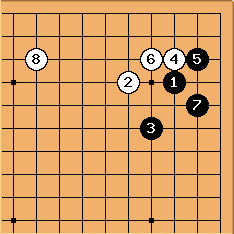 Twelfth is better for white than eleventh so they can't both be joseki. 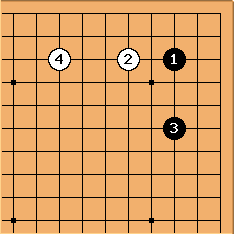 maruseru: I agree that the third one is not joseki, but if the eighth one is, that means that the exchange of 3 for 4 in the eighth one, preventing the 3-3 invasion, makes it joseki. 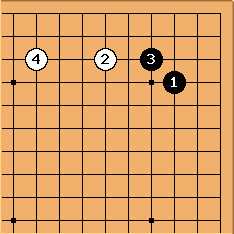 Maybe then this is a useful exercise when considering shapes that aren't joseki (i.e., that are not considered locally equal): Which further moves would be necessary to make it considered locally equal? 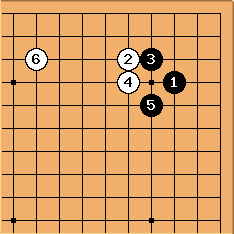 Once you've found those: Could you reverse the order of moves to get that joseki shape? 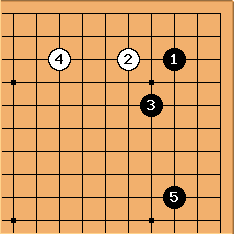 anon: The third one may not be "joseki" according to our Western definition, but at least its a common sequence that we should probably be familiar with and know when to play it. 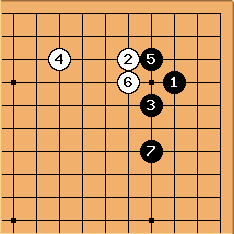 And according to the book, All About Joseki, by Mingjiu Jiang 7d and Guo Juan 5d, on page 72 its referred to as joseki. 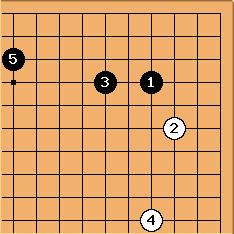 maruseru: The Furuya-Akiyama game you link to does not have this sequence. 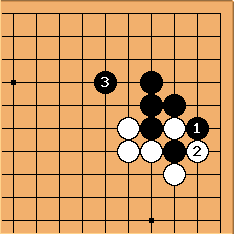 There is something similar-looking in the lower right corner, but Black only gets to make a two-space extension from his two stones, so White wants to overconcentrate Black. unkx80: Actually most of the explanation is already available someone on SL. So I just linked to the relevant pages where possible. 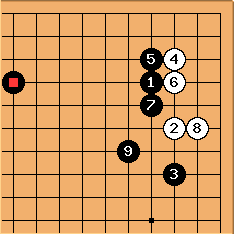 emeraldemon: There has already been a lot of comments on this page, but from my own perspective, the only joseki I would ever teach a DDK are 1, 2, and 9 on this list: a simple 44 joseki, a 33 invasion, and a simple 34 joseki. 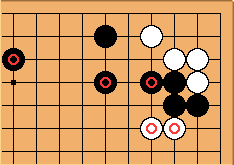 Memorizing more joseki probably causes more damage than help (see Joseki as a Source of Bad Habits and Learning Joseki loses two stones strength), and really understanding why certain moves are good or bad is (I think) beyond the strength of most DDK, and even most SDK. 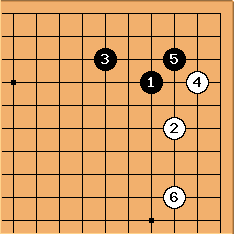 Don't mean to denigrate the original author, but if a random DDK stumbles upon this page, they may be misled about the amount of joseki they should study. Eaglehelm: Sorry about being absent from this page for so long. 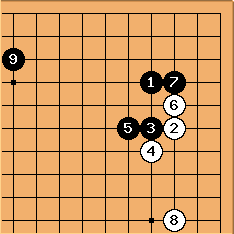 As far as I know all of these are joseki, and while you guys do make good points about people needing to be careful while studying joseki, I think the caveat covers that.